Fidgety? This spinner is all the rage for those times you need to distract and calm yourself. Hold the center button with your fingers and just spin away. 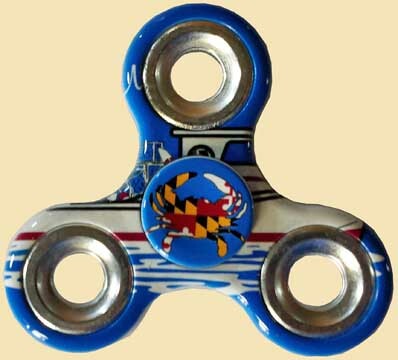 Choose from a Maryland Flag and Crab design or a Crab Boat and Crab design. Addictive and fun! 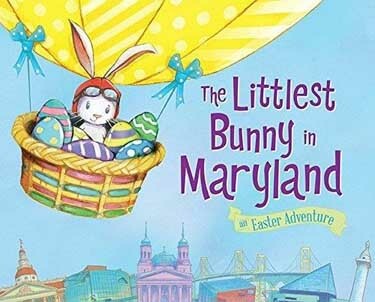 The littlest bunny in Maryland has a big secret - he's the Easter Bunny! Two children get "Flop" from a store and take him on a Maryland adventure visiting sites around the state. All the while Flop secretly hides eggs at each stop. At the end of the book readers are told about the hidden eggs and can then go back through the book on their own Easter egg hunt! Recommended for ages 4 and up. 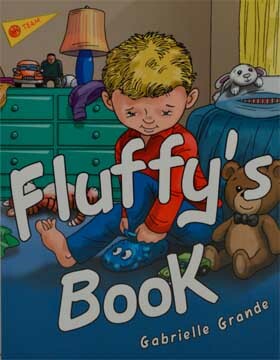 Soft Cover - 20 pages - 8 1/2" x 11"
Fluffy's Book is a charming and delightful tale of a slipper who just wants to be found so he can keep a little boy's foot warm again. Fluffy's adventure begins when a little boy loses him on the stairs. After being pushed down the steps he ends up in with an accidental ride in the washing machine before finding his way back to the closet to await the little boy coming home from school. Colorfully illustrated. 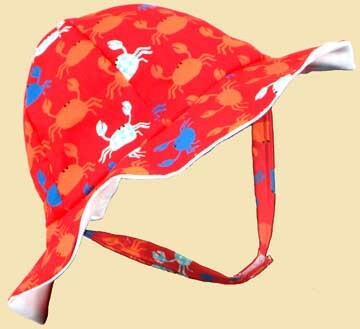 This adorable fabric sun hat fits infants and toddlers. It has a whimsical crab pattern. White lining with Velcro chin strap. **Fabric designs change from time to time and may not be the same as pictured. Fabric will have crabs on it. If you have any questions please call us at 1-888-284-8565. 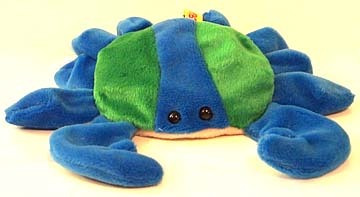 The Chesapeake Bay's most famous resident as a 9 inch blue and green or red bean bag toy. Not recommended for children under 3. This adorable baby spoon is made with lead free, non-tarnishing pewter. Pictured on the spoon is a crab reaching out to grab a fish along with the word "gotcha". Safe for baby use. Made in U.S.A. 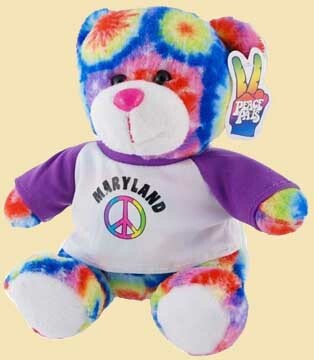 This plush Peace Pal bear is sure to be a favorite with its colorful tie-dyed polyester fur and peace symbol shirt. The word "Maryland" appears above the peace symbol on the shirt. Made of quality polyester and conforms to ATSM safety regulations for toys. One Pair - Approx. 42"
These colorful neon shoelaces are sure to get noticed! Each of the multiple colors gradually blends into the next one. The word "Maryland" is printed in regular intervals along the entire shoelace. Sold by the pair. 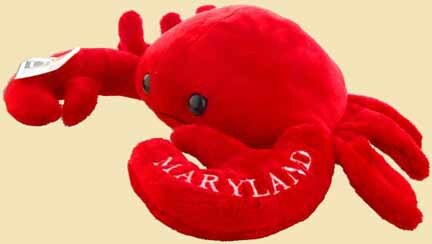 This super soft plush red crab toy had the word Maryland embroidered on its claw. It's very cute and would make a nice friend for any crab lover. Not recommended for children under 3. 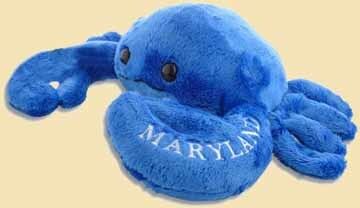 This super soft plush blue crab toy had the word Maryland embroidered on its claw. It's very cute and would make a nice friend for any crab lover. Not recommended for children under 3. 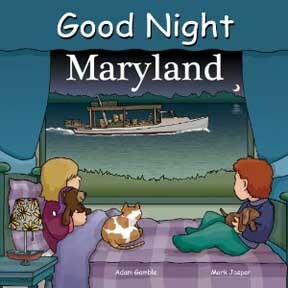 Featuring Maryland icons and places, this great little book is a nice way to introduce your little ones to Maryland and all she has to offer! Visit Ft. McHenry, Ocean City and the Aquarium. Catch blue crabs and bird watch for an Oriole! VERY CUTE! Published in 2011 and part of the Good Night Our World series. 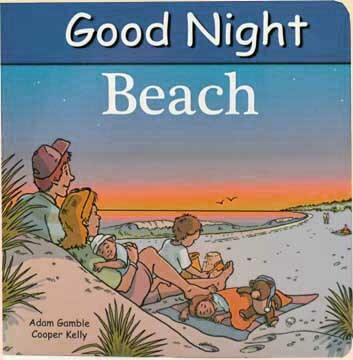 This children's book covers the activities and things you might do and find at a beach. VERY CUTE! Part of the Good Night Our World series. This children's book helps to learn counting from 1-10. 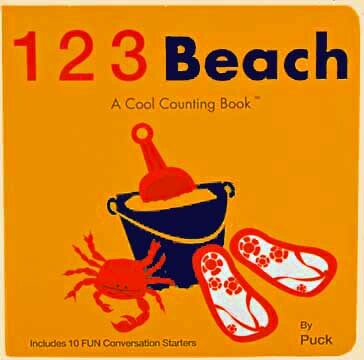 Every page has a number with a corresponding amount of beach related items (1 umbrella, 2 beach balls etc.). The last page has 10 conversation starter questions related to the pictures in the book. Non-toxic. This happy crab wind-up toy moves it's claws, legs and body up and down as it walks sideways. Plastic body. Not recommended for children under 3. Travel beneath the Chesapeake Bay, where Spud, a feisty young blue crab, hates to nap. Waking his underwater friends, Spud launches a rollicking Christmas Eve party that is interrupted by an unexpected traveler in need of Spud’s help. Can Spud help bring Christmas to the Bay? Soft Cover - 96 pages - Approx. 10 1/2" x 6 1/4"
Children will spend hours upon hours discovering, learning, coloring, and having fun, with this big activity book. There are coloring pages, connect dots, mazes, word searches, and many more fun activities. Children will learn about Maryland's history, geography, people, places, animals, legends, and more. Chadwick is a happy Chesapeake Bay blue crab who enjoys a wide circle of friends - quiet Orville Oyster, Matilda (a fussy, near-sighted egret), Toulouse the French Canada Goose, Bernie the Sea Gull, and especially Esmerelda, the prettiest girl crab in the entire bay. But Chadwick yearns for adventure and decides that more than anything else he wants to be a star at the aquarium in Baltimore. This is the story of how one little crab realizes a very big dream. 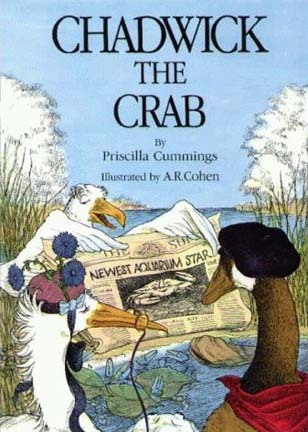 Priscilla Cummings’s Chadwick the Crab series has been a staple of Chesapeake juvenile literature for more than a decade. Now Ms. Cummings turns her hand to another classic genre, the ABC book, this one with a Chesapeake regional flavor. From “A is for anchor” to “Z is for a zephyr,” the sights, sounds, and feel of the Bay come through to the youngest of readers. This is a perfect way to introduce toddlers and preschoolers to the wonders of the alphabet and instill in them a love of the Chesapeake. Whimsical drawings by David Aiken illustrate the verses about Chesapeake animals and things. Preschool to grade 2. 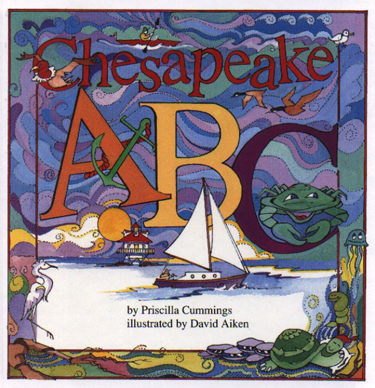 In Chesapeake 1-2-3, companion book to Chesapeake ABC, the bay comes alive for preschoolers and toddlers learning to count. Pages and scenes grow more crowded as readers approach "ten," then see all the numbers once again. One girl went out to fish; two ospreys fly up high; three sails are on each boat; learn to count--the Chesapeake Way! This book will delight youngsters with its clever rhymes and whimsical drawings. Preschool to grade 2. Kids will go crazy for this quirky book featuring a loveable crab, bright and simple art, charming rhymed text, and best of all, an adorable finger puppet! 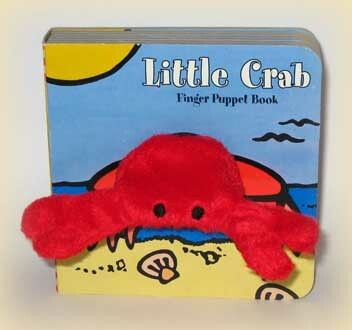 The red crab finger puppet is permanently attached and there are peek-a-boo holes in every page, presenting a fun way for parents and children to play and read together! 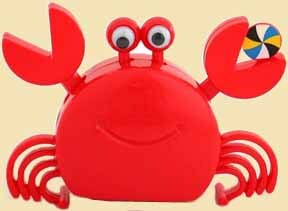 This great novelty crab claw pen will bring lots of smiles at the office or in the classroom. Just use the side lever to reveal and hide the pen tip. The claws move when you press the lever that opens and closes the pen. 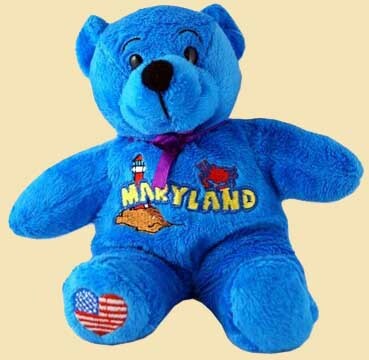 This little blue bear has a lighthouse, crab, and the word "Maryland" embroidered on its chest. An American flag is embroidered on its paw. Maryland fun facts tag. Made of polyester fiber with foam and bean bag bottom. Washable surface. Safe for all ages. 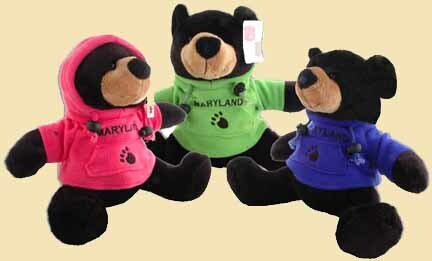 This cute black bear is wearing a colorful pullover hooded sweatshirt that has the word "Maryland" and a paw print embroidered on the front. The shirt is assorted colors, our choice, although if you have a preference you can type it into the special instructions box during checkout and we will do our best to meet your request. Not recommended for children under 3. *The photo shows 3 bears. The price of $12.95 is for 1 bear. 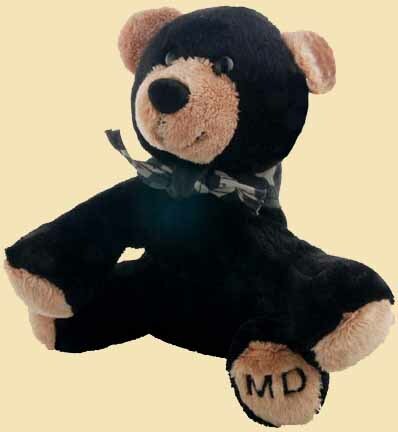 This cute black bear is wearing a camouflage scarf around his neck and has "MD" embroidered on his paw. Brings thoughts to mind of beautiful Western Maryland and is a super soft bean bag style plush toy. Not recommended for children under 3. 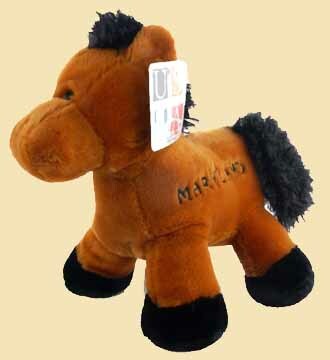 This cute chestnut colored plush horse has the word "Maryland" embroidered on his side. He has a fuzzy tail and mane and has bean bag filled feet to make him stand up. A cute addition to your stuffed animal collection and a nice gift alternative for anyone that's not a seafood lover. Not recommended for children under 3. 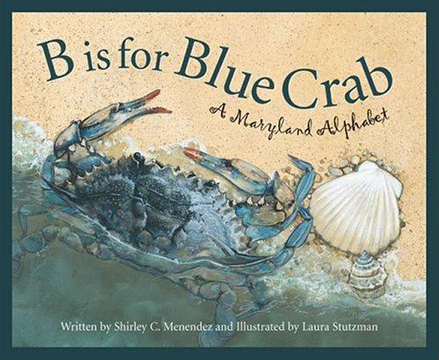 From Muddy Creek Falls to the Chesapeake Bay, the reader will be delighted to discover the beautiful state of Maryland in B is for Blue Crab: A Maryland Alphabet. Explore the B&O Museum, the sport of jousting, the history of The Star Spangled Banner, Oriole Park and of course, the Blue Crab! 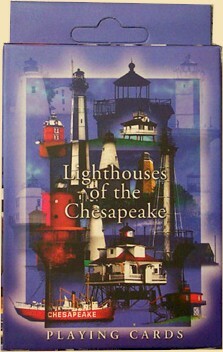 Learn about Lighthouses, the Naval Academy, Johnny Unitas, Harriet Tubman and much more! Catch Me If You Can is the story of Pinky, the Sea-Wise Crab. 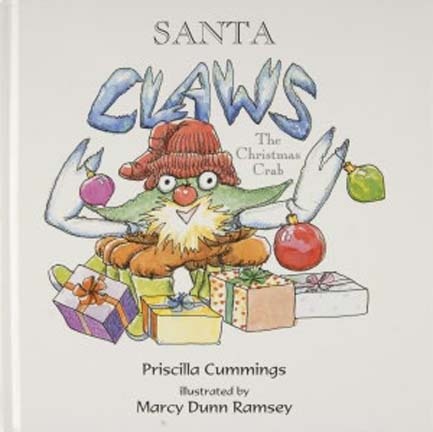 Of the tens of thousands of crabs handled by the author, Judy Brunk, Pinky was unique. Unlike all the others, he never tried to pinch her. This is the story of how Pinky manages to outwit all the watermen and other natural predators as he grows to a full size Jimmy crab with no missing fins or claws. Sometimes he escapes with sheer luck! 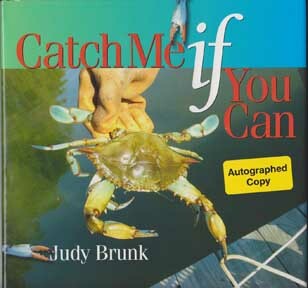 The author Judy Brunk, and her husband, have been shedding crabs along the waters of the Chesapeake Bay for more than 27 years. Shedding is the practice of harvesting soft crabs. Quote from Whitey Schmidt, Blue Crab Guru: "Judy Brunk has combined fact, fun and fiction to tell an enchanting tale of a sea-wise crab that informs and delights readers. Judy's book is filled with fascinating and little known facts that will cause crab lovers to rejoice." 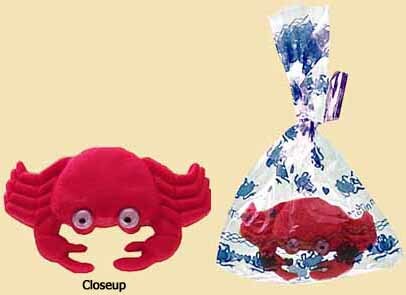 These cute little crab erasers have the googly eyes and come packaged in a cellophane bag. Buy by the set of 60 and the erasers are only 65 cents each. A great coloring book for all ages! 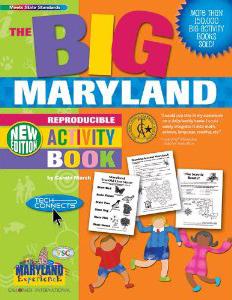 Includes Maryland characters, places, facts and fun! Color your way around the state of Maryland! Kids can color and learn new facts! Lots of fun and educational, too! 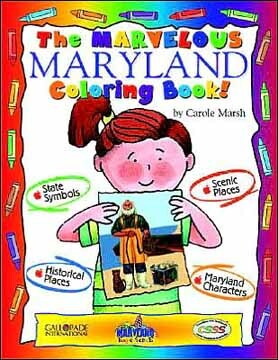 Includes historical Maryland scenes, the state flag and seal, the state flower and dog, watermen, the state butterfly and bird, downtown Baltimore skyline and more! 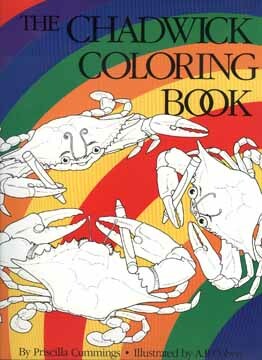 There's hours and hours of fun for children with this Chadwick the Crab Coloring Book. Meet all of the creatures who inhabit Shady Creek, a tributary of the Chesapeake Bay: Chadwick the Crab, Esmerelda the Crab, Matilda the Egret, Orville Oyster, Toulouse the Goose, Bernie the Sea Gull, Dr. Mallard and many others. By Priscilla Cummings and illustrated by A.R. Cohen. 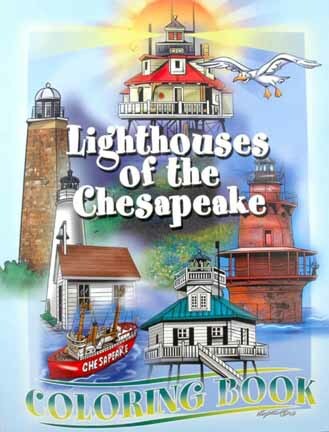 There's hours and hours of fun for children with this coloring book of Chesapeake Bay lighthouses. It will also teach them the names and locations of these historic landmarks. Hard Cover Board Book - 22 pages - Approx. 6" x 6"
Curious children will learn to count to 10 using some of Baltimore’s most famous symbols and attractions—the Maryland Zoo, the Baltimore Orioles, the Baltimore Ravens, Pink Flamingos, the Blue Crabs, and the iconic homes known as the Painted Ladies—in this board book featuring dazzling colors, and bold, clear design. 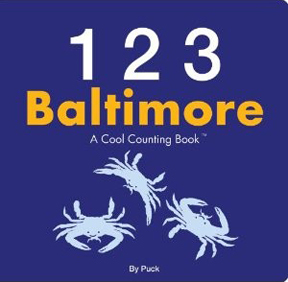 The final page includes a complete location list in both English and Spanish to help parents locate the symbols and attractions and plan an entertaining trip to Baltimore. 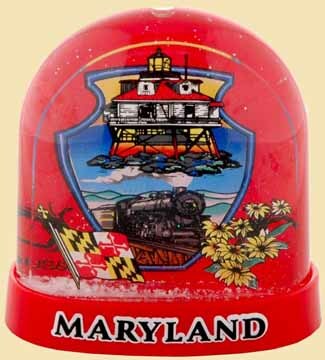 Inside this plastic snow globe are a few of Maryland's well known symbols. The background has a scene of a locomotive flanked by a couple of crabs. The foreground has the Thomas Point Lighthouse, the Maryland Flag, and a bunch of Black-eyed Susans, the Maryland State flower. Plastic coated cards - approx. 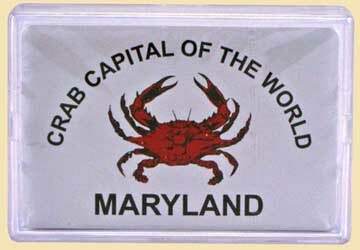 3 1/2" x 2 1/4"
These playing cards say it all: Crab Capital Of The World - Maryland. Red colored crab design in center. Cards are plastic coated and come in a clear plastic case. 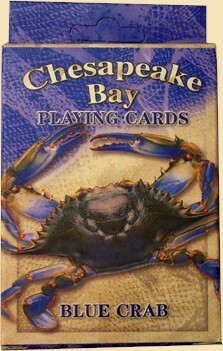 This standard deck of playing cards features the Chesapeake Bay Blue Crab on the back of each card. 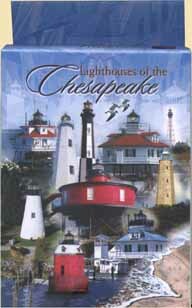 This standard deck of playing cards features a collage of Chesapeake Bay Lighthouses on the back of each card. 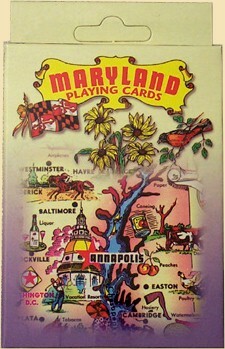 This standard deck of playing cards features a collage of Maryland places and symbols on the back of each card. 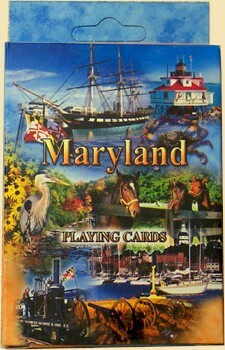 This standard deck of playing cards features a collage of photographic scenes of Maryland places and symbols on the back of each card. 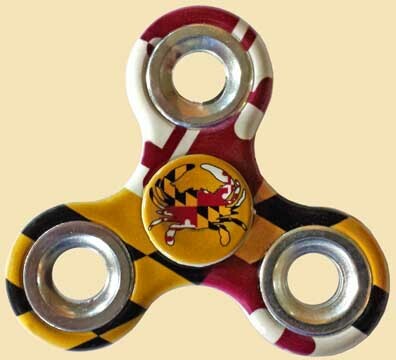 VISIT OUR RETAIL SHOP AT THE MARYLAND STORE. CLICK HERE FOR DETAILS. Or call our toll free number: 1-888-284-8565.